1. Sterilize your tools! 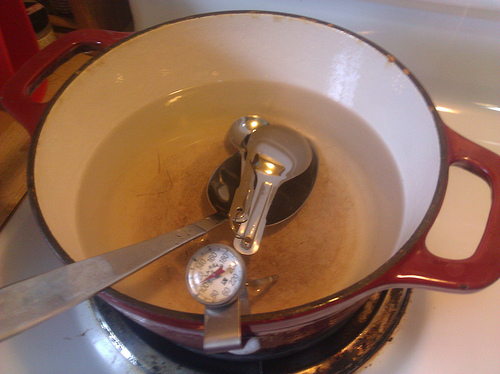 A non-aluminum pot, metal measuring spoons, metal spoon, and a thermometer. 2. Get 2 liters of light cream or half and half. Bring them up to 72 degrees. 3. Find yourself some nice mesophyllic starter bacteria. Mine is from France. Oooh la la! 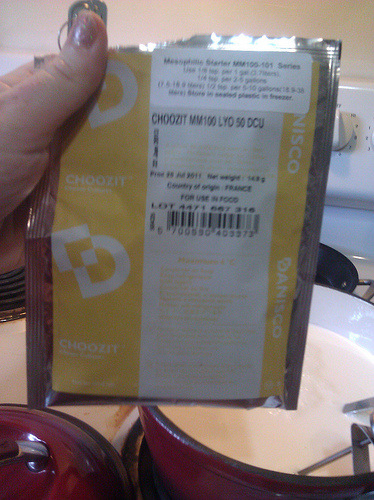 I got it from an online cheese supply store. This is 50 doses worth! 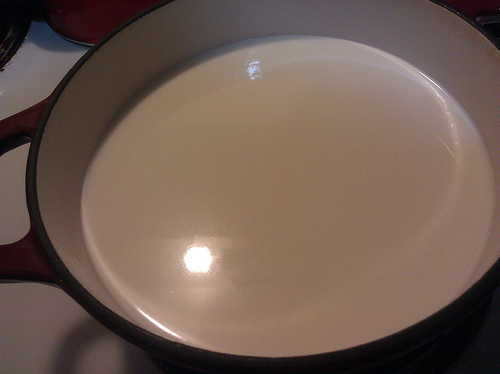 Then it magically gets nice and solid and smooth and beautiful. So thick you can scoop it. 5. 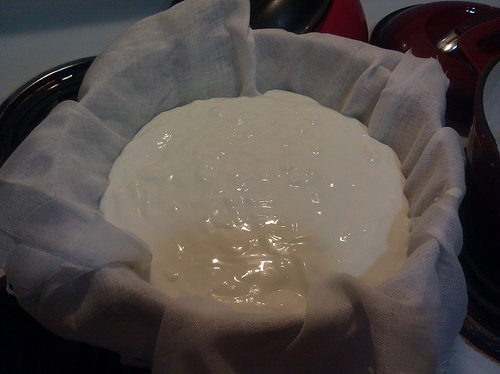 Put it into butter muslin (fine cheesecloth for soft cheeses) to hang for 12 hours. I just tied mine to a wooden spoon and hung it in a pot. I couldn’t let it hang 12 full hours, but this is what it looked like after 9 or 10. So I put it in the fridge and let it sit for the rest of the day. When it was done I put it in a container made for veggies that has small holes in the lid and a little stand on the bottom (so fruit doesn’t sit in water) that lets it continue to breathe and release any extra liquid. Well, maybe I will. Or maybe not. All I know if I had sick kids, and those kids have a favorite juice. Passionfruit juice. And that juice was on sale! Yes! And I have a child who doesn’t like to eat much. When she’s sick, she eats even less. So I decided to try to protein up her juice. 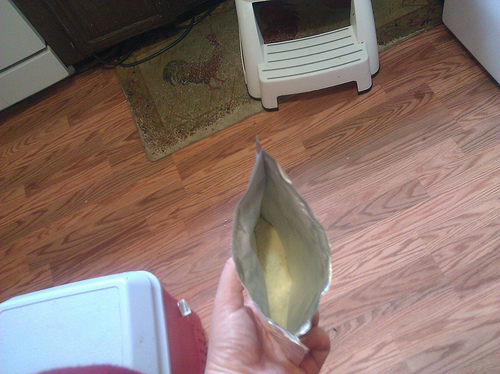 I found some packets of plain gelatin in the pantry from when I tried a gf bread recipe that required it. 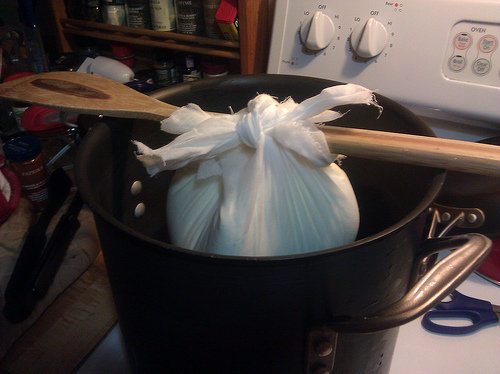 Instead, I just used it to make homemade gelatin. It was so easy. Sprinkle 4 packets (one box) of gelatin over 1 cup of juice while you bring another 3 cups of juice to a boil. Then mix and put in a 13 X 9 pan and cool in the fridge for 3 hours. Then I cut it up with stars cookie cutters, because food is more fun when it’s a shape. Last year I was inspired by The Gluten Free Ratio Rally (#gfreerally on Twitter), which is a monthly blogging carnival in which people create gluten free recipes just based on the ideal flour:fat:liquid:egg ratio as stated in Ruhlman’s book Ratio. The idea that gluten free baking is something that is understandable instead of some arcane set of rules that make no sense is very exciting for me. Anyway, I’m slowly trying to invent my own recipes or convert our old family recipes to something I can eat. I want to avoid or reduce rice flour and starches as well, plus use some nutritious grains such as teff. I really love sorghum, and tend to use it a lot. I made this recipe quick and messy with a random mix of flour and it turned out pretty well, but I wanted to make it again and improve it based on what I’ve learned about gluten free baking. And I did. The first batch suffered some that gritty sort of crumbly texture gluten free baking often has. The second one has no such trouble! It has a nice soft, lovely crumb, thanks to a full tsp of xanthan gum, sweet rice flour, and double the eggs. I’ve done it! I’ve improved a recipe! It’s absolutely science, but you get to eat it. This recipe makes 16 brownie-sized squares and comes together quickly with very few dishes, so it’s nice to whip up in a hurry. 2. 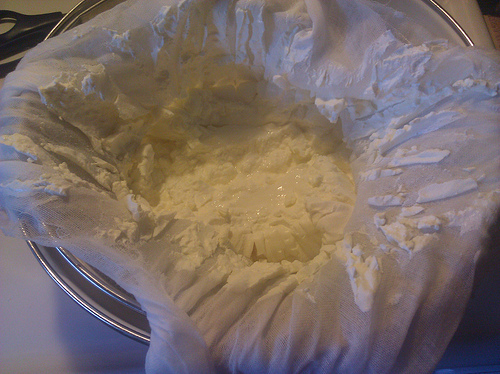 Melt butter (on stove or micromave) and remove from heat. 3. Add sugar and peanut butter and mix. 4. Blend in egg, milk, and vanilla. 6. (optional) Fold in chocolate chips. 7. Spread in a 9x9x2 square pan. (Sprinkle more chocolate chips on top if you want). 8. Bake for 25 mins or until you can insert a toothpick and remove it clean. 9. Let cool 5 mins, then cut and serve warm or let cool. sorghum to 210 grams. The wheat flour equivalent is 1 1/2 cups. (The conversion is easy — each cup of wheat flour weighs approximately 140 grams, so replace with an equal weight of gf flours, making sure to use about 25% starch.) 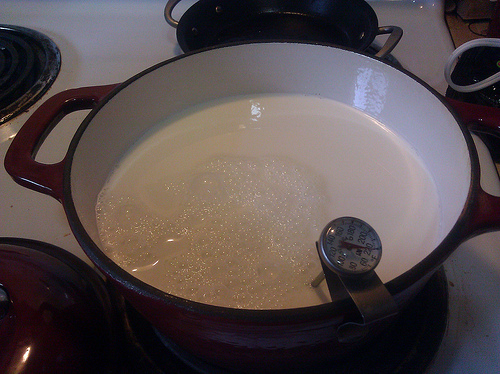 On top I add the xanthan gum, baking soda, and salt so I can pre-mix them together a little. I had a few old bananas laying around the other day, and no one in the house will eat a banana once it’s gone grown. If it has some spots, my husband will eat it, but I prefer mine a little green on top. Once they go all brown, the taste is just weird. But old brown bananas are perfect in banana bread! So, I did a quick search at Gluten Free Girl and the Chef for a recipe for banana bread. I tend to love their recipes and I’m always looking for a recipe that uses teff, one of my new favorite grains. The first time I made it with the kids, we used homemade fat free yogurt instead of full fat yogurt and we skipped the crystallized ginger, and it turned out great! What a wonderful way to use up bananas! I really enjoy recipes that use interesting flours like sorghum and nutrient-packed, flavorful grains like teff (it’s a complete protein!) instead of so much rice flour. Even the kids and my husband loved it and ate the whole thing within hours. A few days later we had even more brown bananas so I decided to make two more loaves. I substituted the homemade yogurt again, and decided to try crystallized ginger (without chocolate) in one, and just chocolate chips in the other. 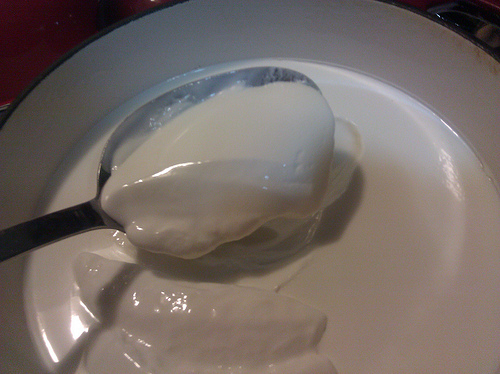 I also used coconut oil instead of butter to make it lactose free and milk fat free. Once again, it was eaten up in record time, though The Boy did not like the non-chocolate chip version. Oh, and the baby refused them all. I have no idea why. 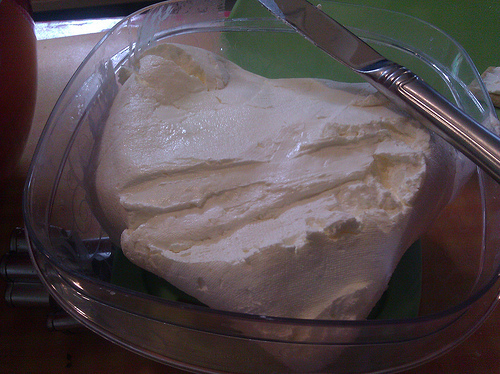 Above, you’ll see the first loaf posing with my new hand-held mixer (thanks mom!). For recipes as quick and easy as this one, it seems pointless to drag out the big Kitchen Aid mixer. A lot of quick bread recipes such as this one, brownies, pancakes, and the peanut butter bars I’ll be posting soon, actually don’t even want to be mixed up all that much, making a hand mixer ideal. I wish I had a picture of today’s invention, but I was so excited to have it, that I ate it in a hurry. I haven’t had hot and sour soup in several years, since I discovered I was gluten-intolerant. That means I can’t eat wheat, barley, rye or anything made with them — including soy sauce! So I’ve had to re-invent and adapt and scrounge for gluten-free versions of everything I used to love to eat. Especially when it comes to Chinese and Japanese food because so much of it is based on soy sauce. Put everything but the egg in a saucepan on high. When it boils, turn it down to medium. Simmer until carrots and mushrooms are as tender as desired. 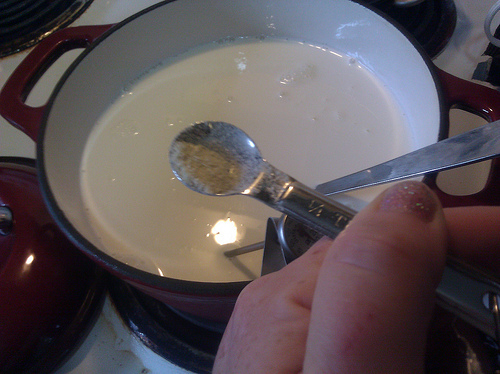 Take off heat, slowly dribble in beaten egg while you stir, to “feather” the egg out into the soup.